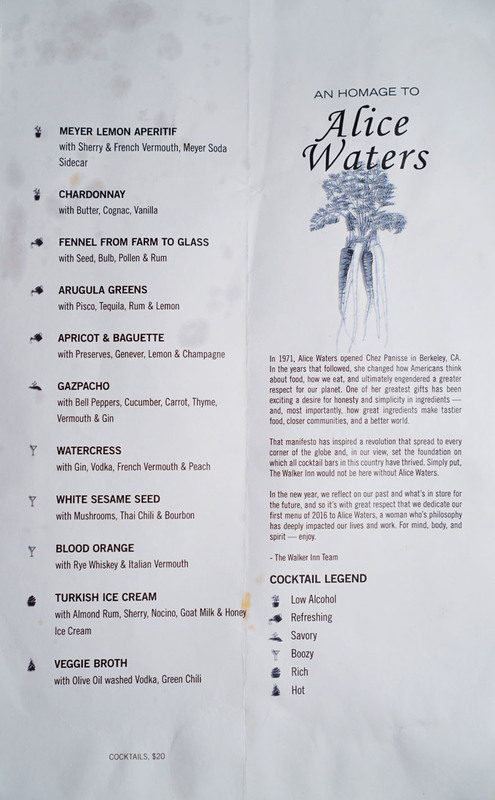 Historically, LA hasn't really done the whole high-concept cocktail bar thing, but that changed last May with the debut of The Walker Inn. Set within Koreatown's Normandie Club (next to Le Comptoir), it's the work of Alex Day, Dave Kaplan, and Devon Tarby of Proprietors, as well as the folks behind 213 Hospitality. Katie Emmerson's in charge of the day-to-day and the Inn's perpetually-changing, thematic menus, while Bryan and Carrie were our bartenders this evening. The Walker Inn's a dark, cozy space with room for a mere 27. Note that seats at the six-person bar are solely available for two guests at a time, and are omakase-style-only ($45 this evening, for half and quarter portions of the cocktails), so larger parties will likely have to make use of the lounge area. 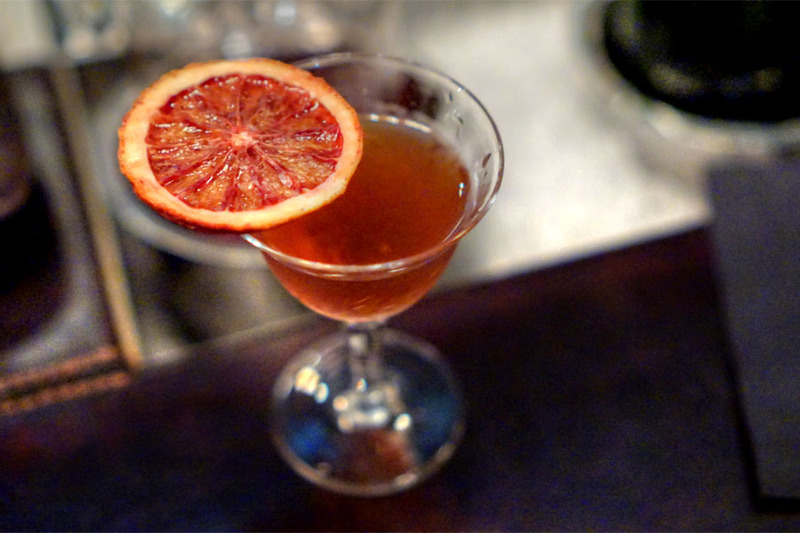 The cocktail menu changes every month or two, and each features an overarching inspiration. The place debuted with Pacific Coast Highway as its muse, then moved to American Summer, Apples, Holiday Scoundrels, and our theme for the evening: Alice Waters, that beacon of California cuisine. If you're not feeling quite so adventurous, you can order classic cocktails not on the list as well. Click for a larger version. Our experience began with a winter citrus welcome cocktail. It comprised a cordial of Shasta Gold mandarin, pommelo, a mandarin-blood orange hybrid, grapefruit, and citron (for some tropical notes), mixed with Crémant and sprayed with a cinnamon tincture. I found it a light, refreshing, effervescent drink, almost punch-like at times, with a citrusy, floral base punctuated by a bittersweet bent and a smidge of cinnamon spice. 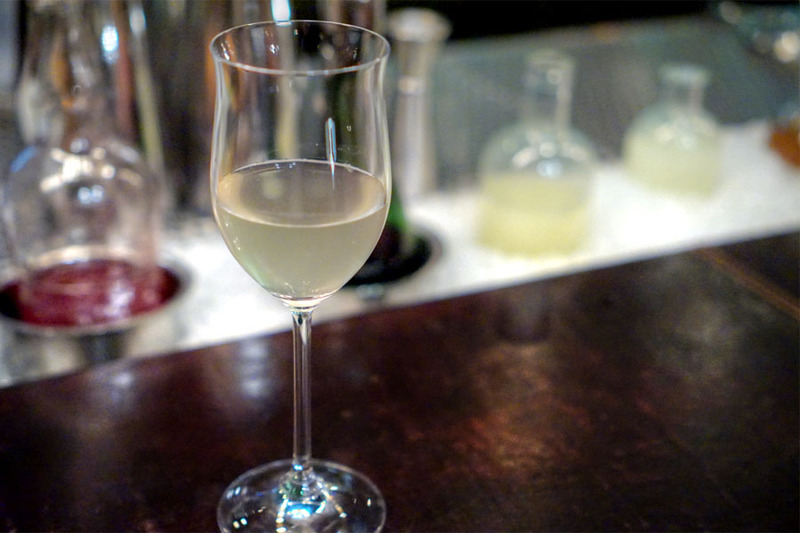 For our first proper cocktail, the team took a light, dry, acidic Burgundy, then washed it with butter. This was then combined with Pierre Ferrand 1840 cognac for an aged quality, a Madagascar vanilla liqueur for more lushness, and Clear Creek pear liqueur for brightness/sweetness. The result was an exaggerated representation of a northern California Chard, a fun quaffer that really worked as a super buttery, overly oaked, caramel-y, candy-finished caricature. Very neat. Next was a showcase for one of Alice Waters' favorite fruits: Meyer lemon, the sweetness and acidity of which was presented in two ways. The aperitif (bottom photo) was a take on a classic Bamboo, a lower ABV offering combining dry vermouth, blanc vermouth, pisco, Fino sherry and lemon zest. Here I got the sweet, piercing flavor of the citrus up front, leading to the sherry's oxidative, nutty notes, with the vermouth always apparent in the background. We also had a refreshingly sweet 'n' sour lemon soda, which worked to offset the intensity of the cocktail. 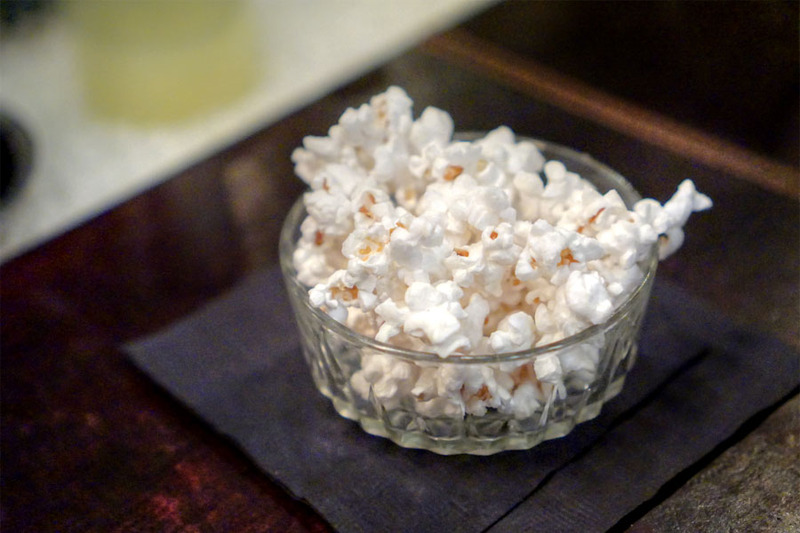 To munch on: an addictive coconut oil-sea salt popcorn. Loved the sweet to salty transition on this one. 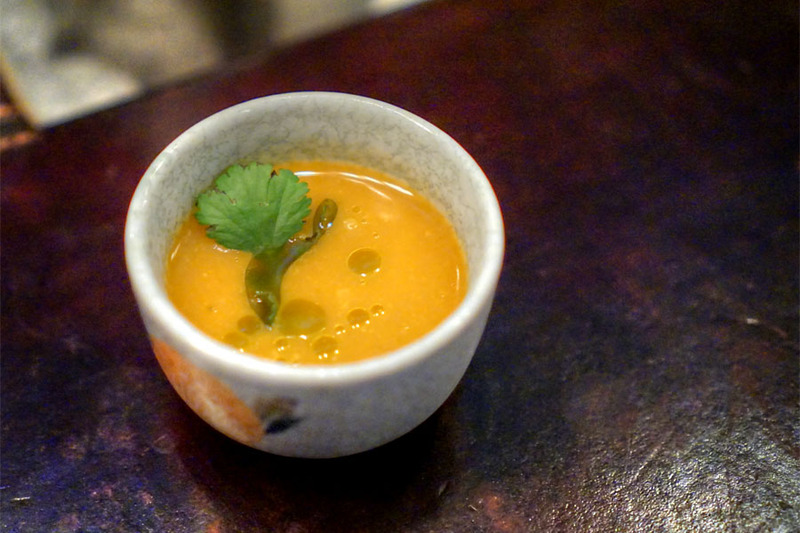 One of my favorites was this literal, low ABV take on gazpacho. They started with a base of Tanqueray Old Tom, Fino sherry, and thyme-infused Dolin dry vermouth, then mixed in lemon, cucumber, celery, carrot, and red/orange bell pepper juices, and finished things off with sherry vinegar, avocado, and salt. It really captured the essence of the traditional soup, bringing forth loads of savory, vegetal flavors with nary a trace of alcohol. 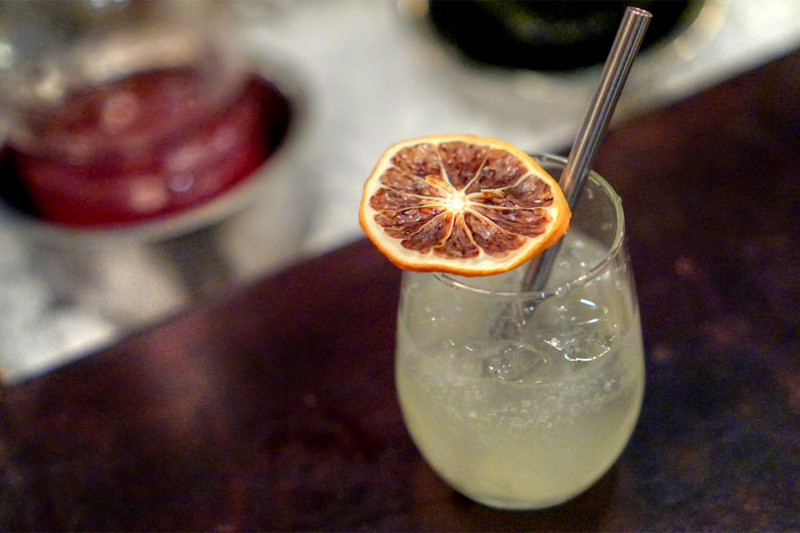 Our next cocktail was a French 75 variation inspired by a story of Waters experiencing a revelatory pairing of hot baguette and apricot jam while training in Paris. What we had was Diep 9 barrel aged jenever (chosen for its yeasty qualities), lemon juice, sugar cane syrup, and apricot preserves, shaken up with Manzanilla sherry, then strained and mixed with Crémant (also yeasty), and finally finished with an atomized French baguette rotovap'd tincture. The resultant drink was lovely and made sense with its backstory, conveying a backbone of breadiness underpinning layers of fruit flavor. 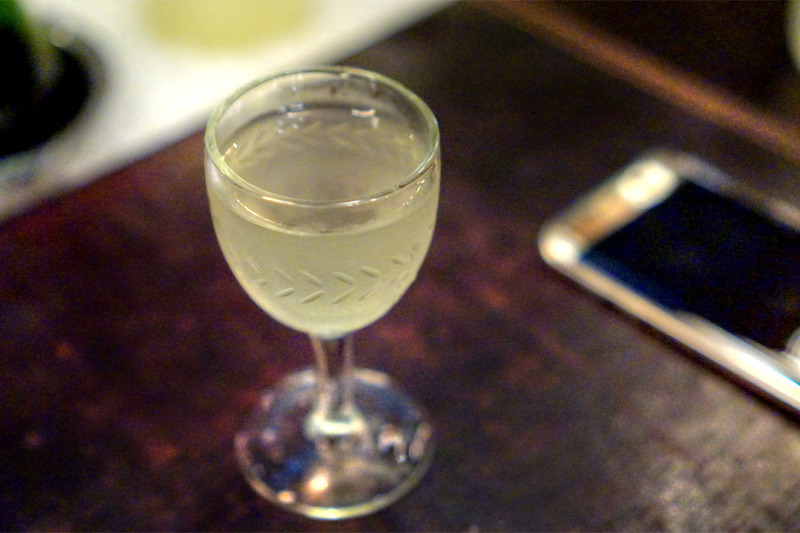 Here, the team wanted to incorporate multiple parts of fennel into a drink. 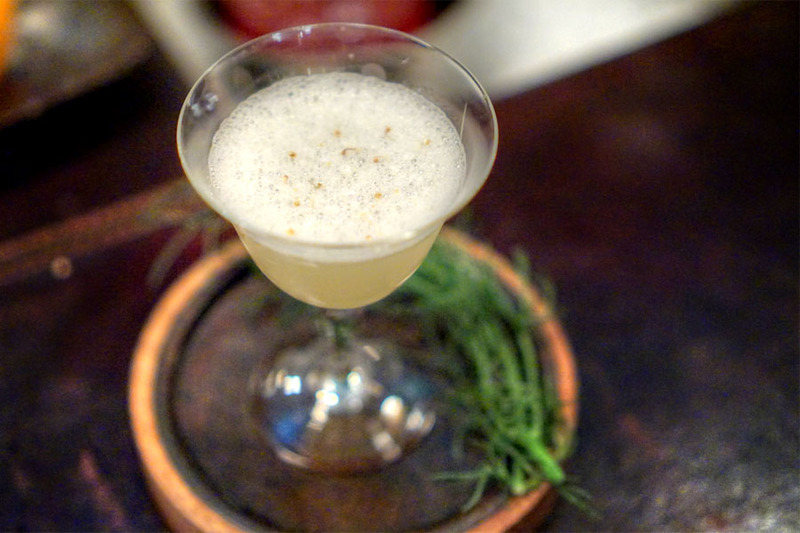 Thus, we had a base of Caña Brava rum combined with juiced bulb, seed tincture, fennel pollen simple syrup, and lemon juice, with fennel fronds as an aromatic garnish. 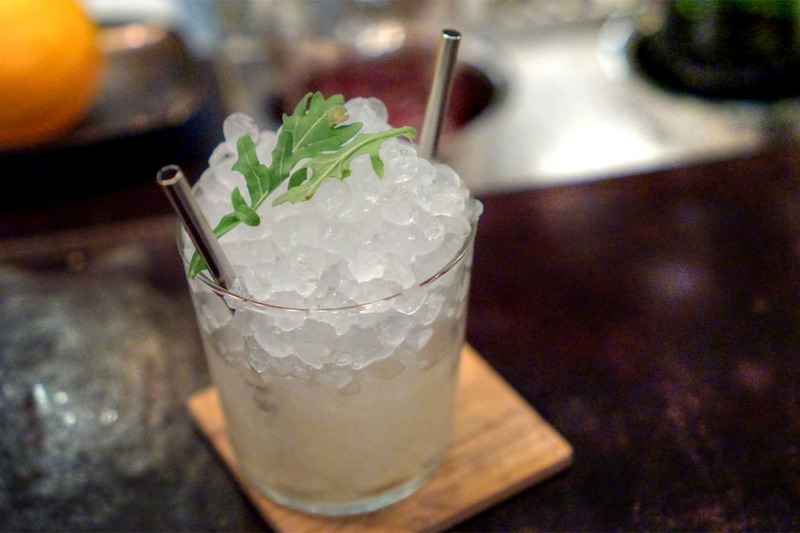 The cocktail forcefully rendered the pungent, anise-y nature of the herb, its potency offset by counterbalancing sweet, almost nutty flavors. Nice. 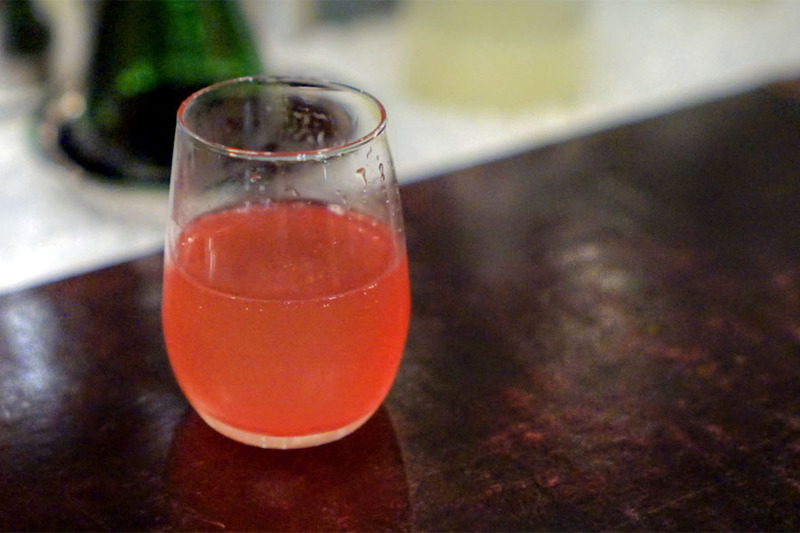 The goal of this cocktail was to recall a popular winter salad at Chez Panisse. 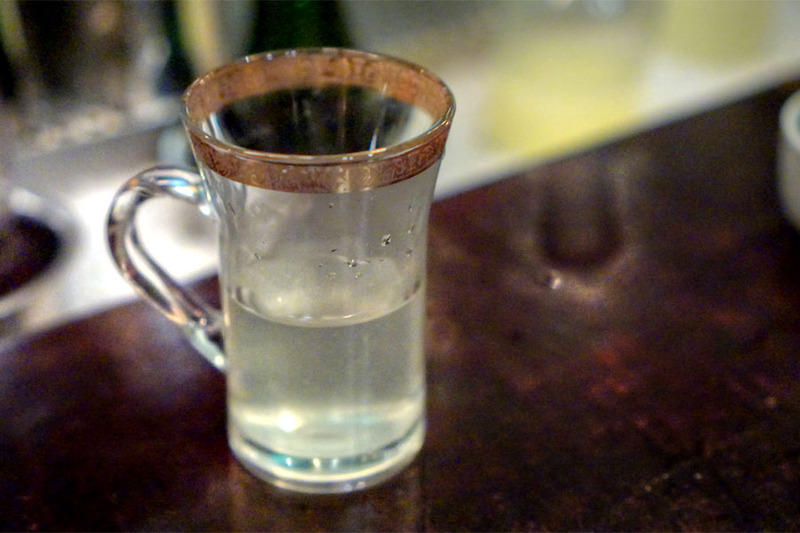 They began with fresh lemon juice, a black pepper tincture, salt solution, and dry vermouth, then blended in rhum agricole, blanco tequila, and pisco. The resulting slurry was then combined with pectin and centrifuged in order to separate and clarify the liquid, while acacia honey and simple syrup were added at the end. Taste-wise, I got the bitter, vegetal, acidic notes they were going for, but fortunately offset by a well-placed sugary element from the honey and simple. 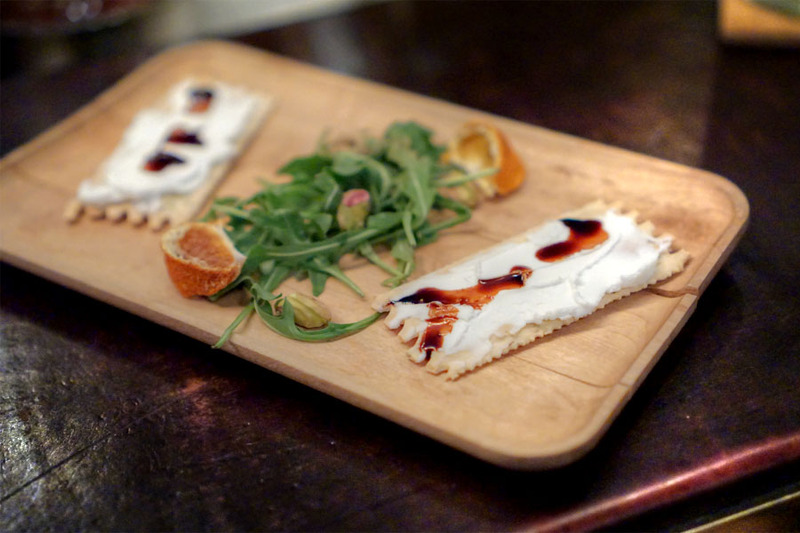 Accompanying the cocktail above were crackers with goat cheese and balsamic, alongside arugula, dehydrated satsuma, and pistachio. Nice marriage of creamy, tangy, zesty flavors here to go along with the drink. Next up: Pierre Ferrand 1840 cognac, Rittenhouse rye, Carpano Antica sweet vermouth, and blood orange zest, subjected to vacuum for 20 minutes in order to allow the citrus oils to integrate, then mixed with a salt solution, stirred, and served. 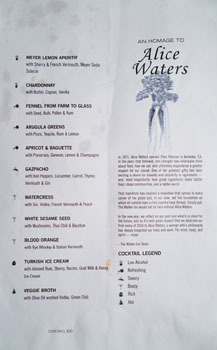 The goal of this Manhattan variation was to do something simple, clean, elegant, minimal, much like Waters' food. And indeed, the blood orange really did shine here, its depth of sweet-tart flavors well-complemented by the boozy, bitter nuances in the drink. Waters is known for her commitment to local ingredients, and so this riff on an Old Fashioned functioned as an ode to K-Town. We had toasted white sesame seeds, Thai chile, and mushrooms (mostly shiitake), infused into Elijah Craig 12-year bourbon. 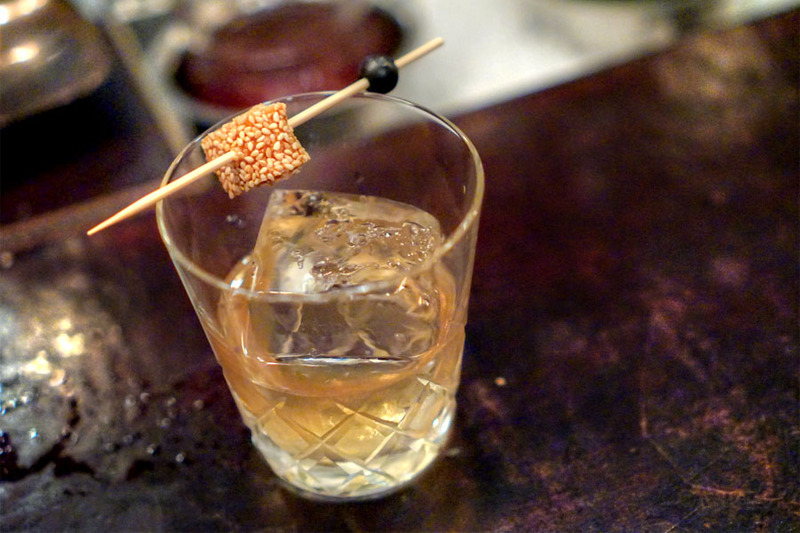 To that, Amontillado sherry, demerara syrup, and sea salt were added, with a Korean-style cookie with peanut and sesame for garnish. It all made for a real celebration of sesame, with a bevy of nutty, Asian-y flavors perfectly integrated with the heft of the bourbon. Loved that savory bite up top, too. Another favorite of ours. 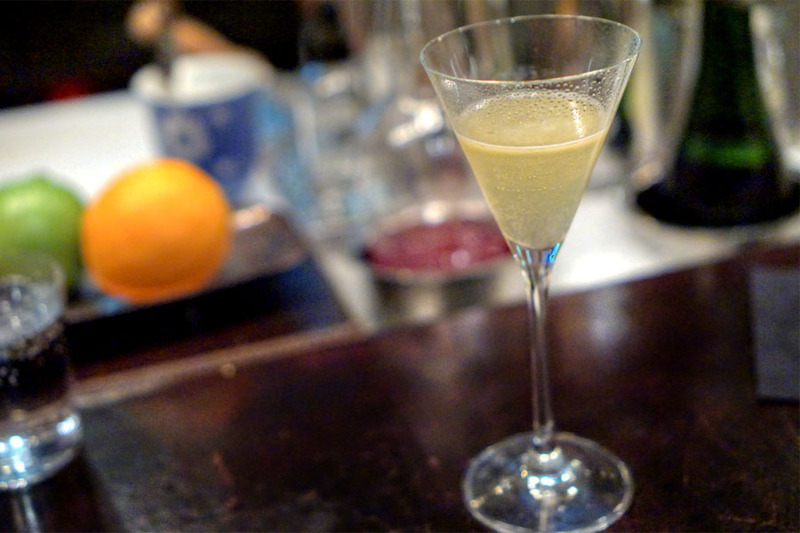 Watercress was the stimulus for this Martini variation. 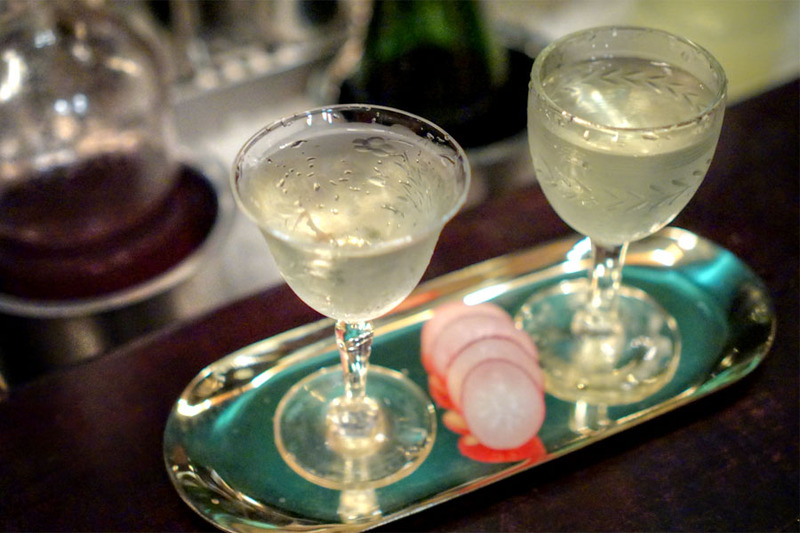 A combination of London dry gin and watercress was put through the centrifuge, then blended with Absolut Elyx, Dolin dry and blanc vermouths, and Giffard créme de pêche, the whole thing garnished with radish. In the end, I got a lot of the peppery, herby notes of the cress, but moderated by a subtle sweet-savory character. Surprisingly multifaceted. Following was a boozy broth, a cocktail that's just what the doctor ordered: chili-infused vodka with olive oil and a housemade brodo incorporating parsley and celery tops. Think cozy, vegetal, hot, heartwarming. 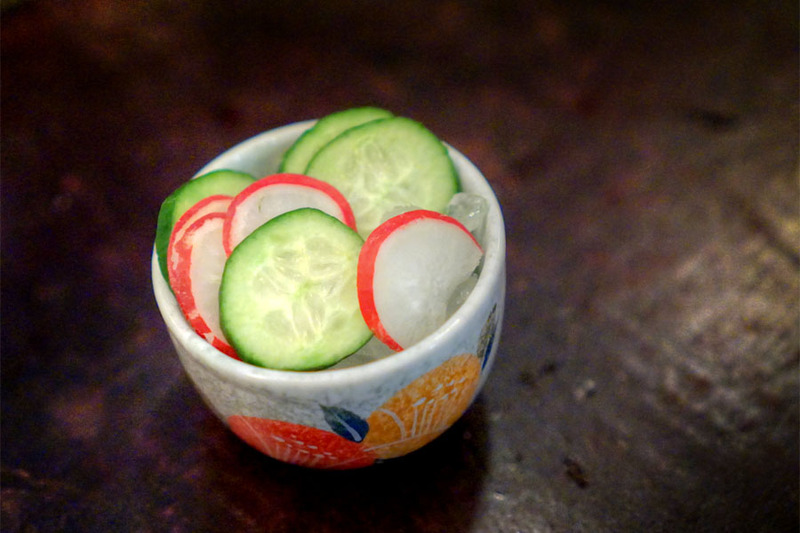 Crisp, chilled slices of cucumber and radish worked as a sort of palate cleanser. The "dessert" cocktail married almond-infused Caña Brava 7-year rum, East India Solera sherry, PX sherry, walnut liqueur, amaretto, and a salt solution. It was the richest drink of the night to be sure, with dark fruit, nutty, oxidative notes abound, and played well with the accompanying mead- and honey-enriched goat cheese ice cream. 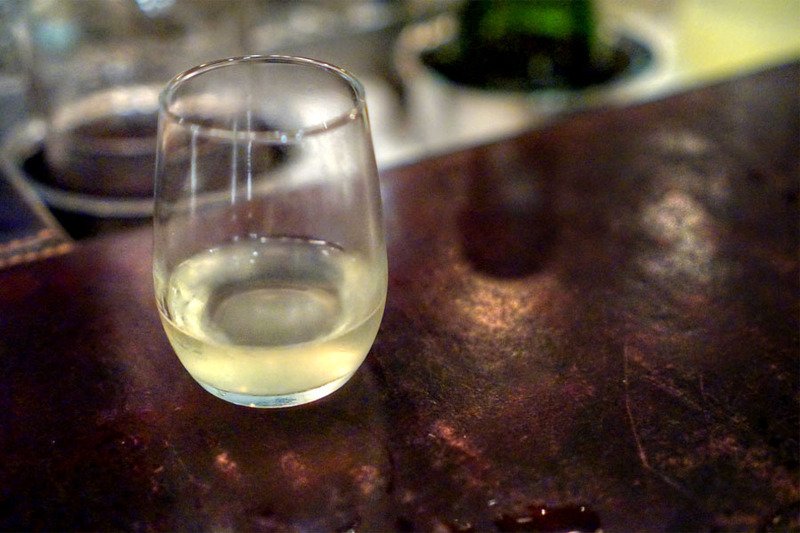 Closing things out was a light German Riesling with St. Germain, verjus, and acacia honey added. 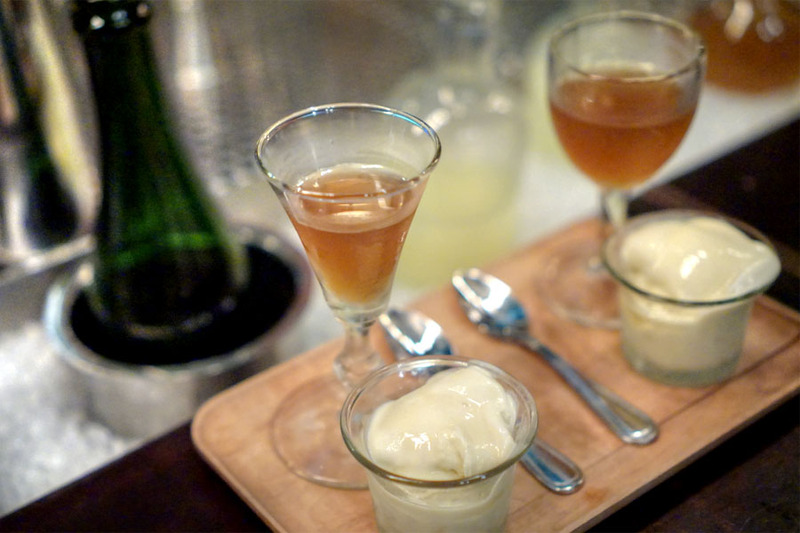 The idea here was to recreate a Sauternes--one of the few wines on the menu when Chez Panisse first opened--and it did a commendable job at that: a viscous drink, giving up loads of sweet, honeyed fruit at first blush, but with a countering acidity that was key. This was my first time at The Walker Inn, and I left suitably impressed. All the drinks were on point--well-crafted, focused, robust in flavor--while service was friendly and engaging as well. However, the cocktails go beyond mere tastiness, and what I really appreciated was the conceptual, cerebral aspect of it all. It's an experience, to be sure. Do you drive home after consuming 13 cocktails?